Below we explain metacognition and provide the vocabulary to teach it. In part two of this series we will focus on strategy selection. 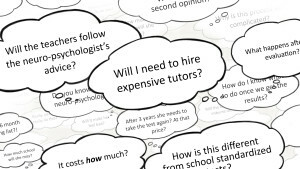 If you’d like to try our full metacognition approach, please contact us here. Cognition is how you learn. Depending on the topic, the context, personal experiences and genetics, each of us relies on different proportions of cognitive skills to understand and remember what we read, see or hear. We begin learning the moment we are born and we never stop. 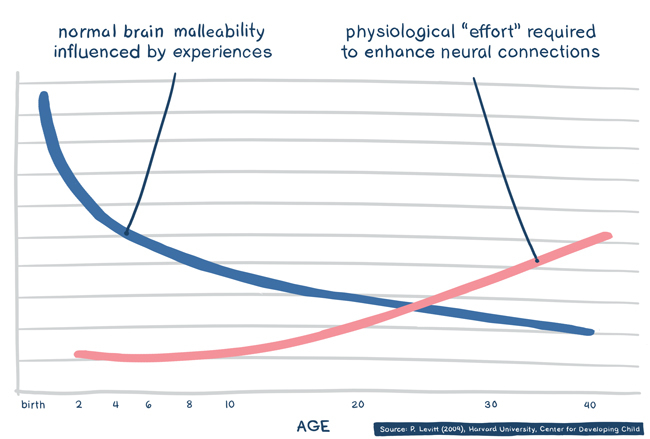 And while neuroscientists have proven that our learning capabilities can and do change over time based on experiences and effort (see Figure 1), it’s not easy. By the age of 10, it requires significant practice and effort to change the brain. And neuroscientists don’t yet have the prescription of how (though they are working on it). But that’s where metacognition comes in. If you can teach students to become more aware of their cognition, you can teach them how to learn in any situation. Metacognition is the conscious awareness of how you learn. When students recognize how they learn, what feels natural, what requires effort and why, you can teach them how to choose effective strategies. Students will need to learn to adapt their strategy choice for the specific topic, situation and their individual strengths and needs. Given learner variability, each student will need to develop their personal set of go-to strategies. In order for students to use metacognition, they must be taught the concept and its language explicitly. Below are the names and short definitions of ten core skills of cognition. Our definitions highlight where the skill has the greatest academic impact. You’ll want to become very familiar with these terms. In part two of this blog series we will talk about how to choose learning strategies based on self-awareness. You’ll need to teach students to choose strategies based on the topic and whether or not the student is strong or has difficulty with the cognitive skill that is typically core to the learning situation. Teaching metacognition is not simple, but it is the key to lifelong learning. So it’s definitely worth it. Verbal reasoning is the ability to understand language-based information. Biggest impact: all subjects when reading, writing or speaking. Greatest predictor of overall academic achievement. Learn more about verbal reasoning. Abstract reasoning is the ability to understand non-language-based information, including numbers, shapes and patterns. Biggest impact: math and science, particularly in higher grades. Learn more about abstract reasoning. Spatial perception is the ability to visualize how objects relate in space. Biggest impact: specific areas of math and science like geometry and physics; hands-on activities; fine and performing arts. Learn more about spatial skills. Attention is the ability to sustain focus, even for tasks that you might not find interesting. Biggest impact: All subjects, particularly those a student finds least interesting. Learn more about attention. Working memory is the ability to mentally juggle multiple bits of information in short-term memory. Biggest impact: Multi-step problem solving in math and science, reading fluency, and following directions. 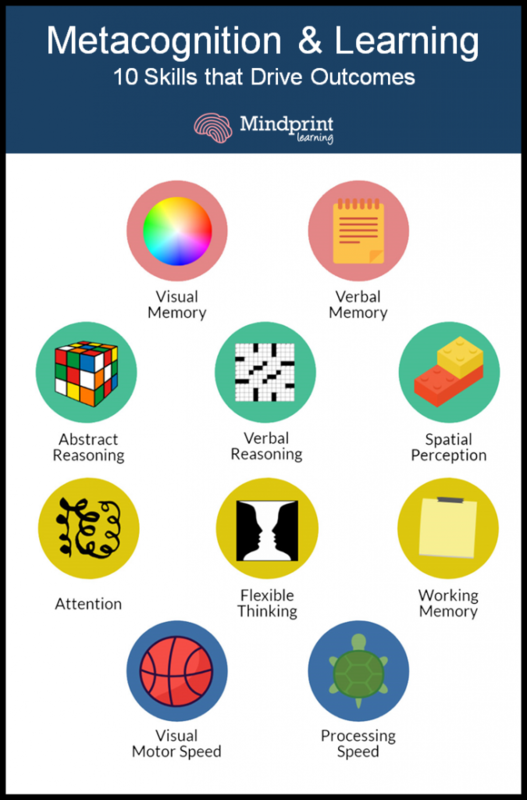 Learn more about working memory. Flexible thinking is openness to taking feedback and adapting to solve novel problems. Biggest impact: Math and science in middle and high school and behavior. Learn more about flexible thinking. Verbal memory is the ability to remember and recall language-based information. Biggest impact: All subjects, particularly in earlier grades when foundational skills are most important. Learn more about verbal memory. Visual memory refers to how efficiently you remember and recall objects, pictures, patterns, formulas and other visual information. Biggest impact: Math facts, math and science more generally, and visual arts. Learn more about visual memory. Visual motor speed is how efficiently your eyes and hands work together. Biggest impact: Handwriting, keyboarding, note taking, and hands-on activities. Learn more about visual motor speed. Processing speed is how efficiently you process and respond to new information. Processing has several sub-categories, including auditory, verbal, and visual. There are also quick thinking processing tasks and slower processing tasks. Biggest impact: Class participation, standardized tests, reading efficiency and homework efficiency. Learn more about processing speed. Look for Part II of this blog series next month.